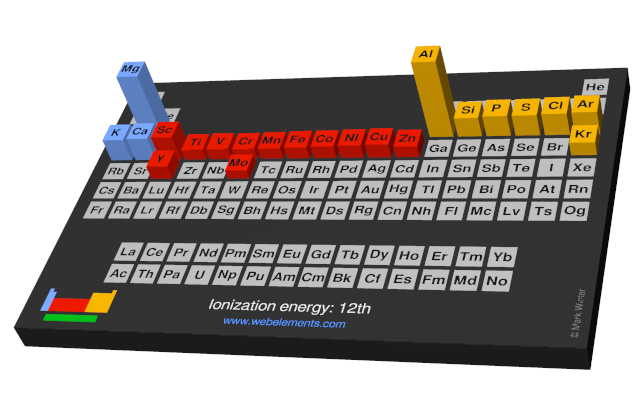 Image showing periodicity of the chemical elements for ionization energy: 12th in a periodic table cityscape style. 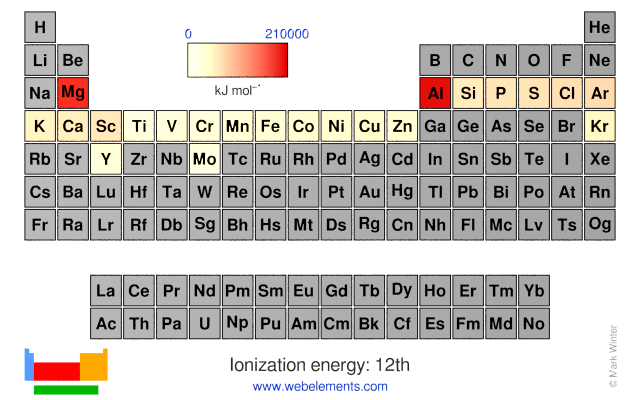 Image showing periodicity of the chemical elements for ionization energy: 12th in a periodic table heatscape style. 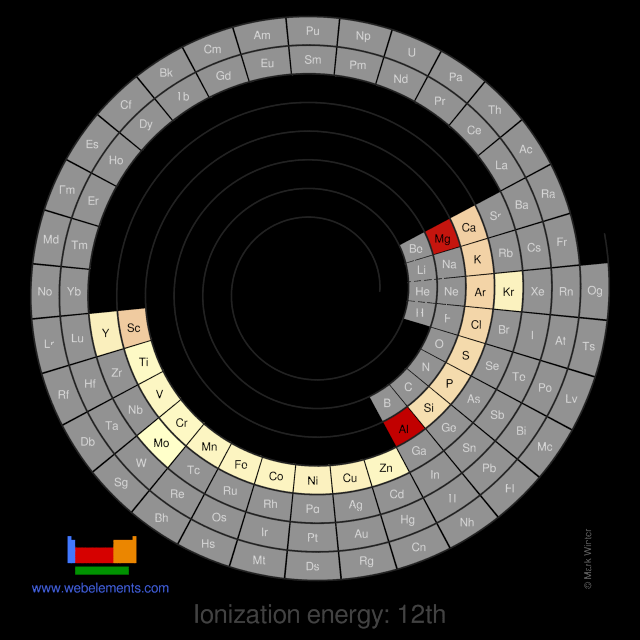 Image showing periodicity of the chemical elements for ionization energy: 12th in a spiral periodic table heatscape style. 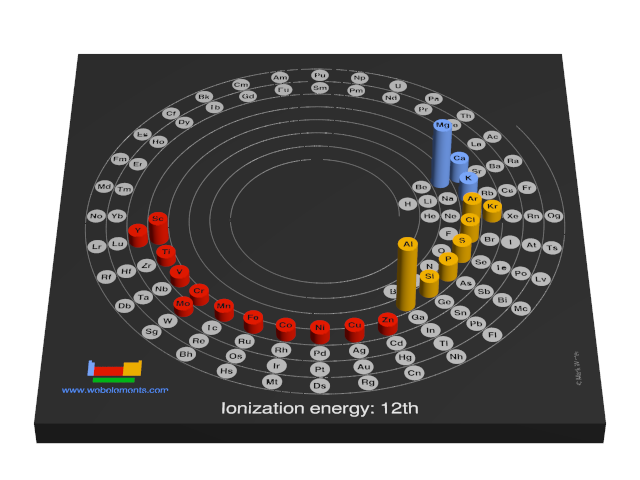 Image showing periodicity of the chemical elements for ionization energy: 12th in a 3D spiral periodic table column style. Image showing periodicity of the chemical elements for ionization energy: 12th in a 3D periodic table column style. J.E. Huheey, E.A. Keiter, and R.L. Keiter in Inorganic Chemistry: Principles of Structure and Reactivity, 4th edition, HarperCollins, New York, USA, 1993. J.A. Dean (ed) in Lange's Handbook of Chemistry, McGraw-Hill, New York, USA, 14th edition, 1992. A. Kramida, Yu. Ralchenko, J. Reader, and NIST ASD Team (2018). NIST Atomic Spectra Database (ver. 5.5.6), [Online]. Available: https://physics.nist.gov/asd [Accessed 10 March 2018]. National Institute of Standards and Technology, Gaithersburg, MD.